On my Tech Fair Day 2012 course in Moodle I had listed some resources for using Google Talk and GMail. You can still enroll yourself in the course, but I’m also going to list those resources here to help you use Google Talk and GMail tips. GMail has a somewhat powerful filtering mechanism that you can apply to incoming email. Unfortunately, I say somewhat since there really isn’t an easy way to select student email and take it out of your inbox. It won’t match on part of an address, so you can’t just search for an email address that starts with a number. To filter email from students, go to GMail and in the search field at the top of the screen enter #studentofkcs and hit the triangle to the left of the blue button with the magnifying class. Then click Create filter with this search. It will have a list of things that can happen to the message when it matches the search. You will want to check Skip the inbox (Archive it), and Apply the label:. 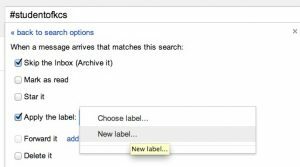 Since you probably don’t already have a label (or folder, if you want to call it that) set up, you can click on the Choose label… and create a new label. I like to put an exclamation point in front of the label so when the list of labels are sorted alphabetically, the ones I’ve created are at the top. Click Create and then Create Filter. From now on, email from students will bypass your inbox and be in the your label created above.